Although most people have heard of the Celts, very little is known about their customs and beliefs. Unlike the Ancient Greeks and Romans, few records of their stories exist. However, the surviving stories have played an important role in literary history—influencing writers like J.R.R. Tolkein and C.S. Lewis. 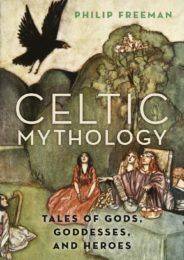 New to Celtic mythology? Jump in by taking the quiz below to find out which Celtic goddess you are. Featured image credit: “Epona Salonica601” provided by QuartierLatin1968 CC BY-SA 3.0 via Wikimedia Commons. Philip Freeman graduated with a BA in Classics from the University of Texas and earned the first joint Ph.D. in Classics and Celtic Studies at Harvard University. He has been a college professor for twenty years teaching classical and Celtic mythology. He is the author of eighteen books and currently hold the Orlando W. Qualley Chair in Classics at Luther College in Decorah, Iowa.